If you're viewing this on desktop, the image below is enabled for you to click the product and shop! Camel Blazer: My tried and true favorite style: the regent. You can get any style that works best for you but I find that fall at work calls a LOT for a nice camel blazer. Mainly so you can get away with wearing your summer/spring tops to the office while also staying decently warm. Fisherman Sweater (tunic version here): There is just something so classic about the fisherman sweater that makes me reach for it again and again each year. I mean what is not to love? It's not as soft as a normal cashmere or wool sweater but the more you wear it the more comfortable it becomes! Cable Knit Sweater: Cable knit sweaters are my weakness in the fall and winter. I have way too many and always seem to be wanting more. I love to wear them on their own or layered over or under for the colder (and preppier) days. I have a personal preference to the Ralph Lauren cashmere, cashmere/wool, wool/knit sweaters but also have picked up and loved the Vineyard Vines and LL Bean cashmere sweaters. Oxford (white and blue): Guys, you know how much I love and wear my oxford shirts. My most worn shirts in my closet that have been by my side since sophomore year of college. They are the best. Waxed Barbour Jacket / Quilted Barbour Jacket: Now you of course don't need both but I wanted to mention both in this post because they really are so great. The waxed is a classic and something that everyone should have for fall. But I'll tell you it's not warm -- it's meant to be worn with sweaters and protect you from the rain. 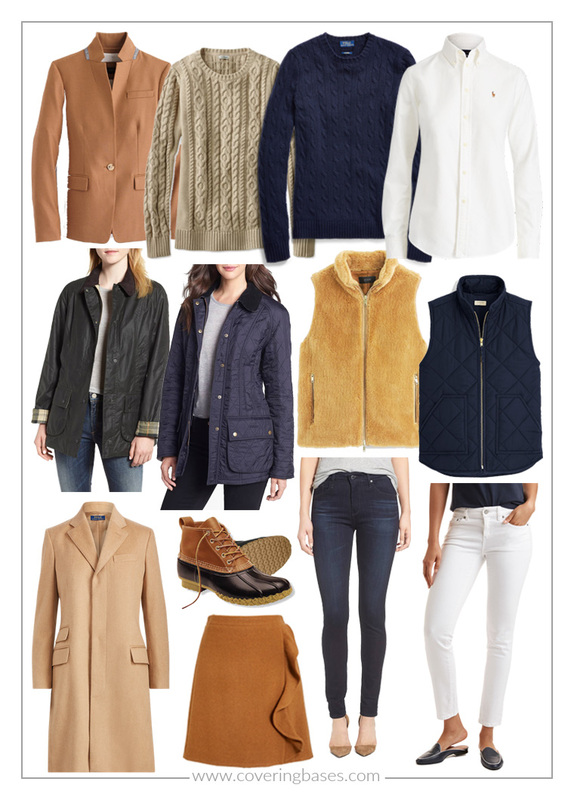 The quilted jacket is much warmer and has a more updated look to it. But you truly cannot go wrong either way -- in any color!! Plush Fleece Vest: Each spring I tell myself I need to get rid of this vest but each year I hold on to it and fall back in love with it in the fall. It's just so fun but is super bulky so be aware. My favorite way to wear it is with a denim oxford, white jeans and bean boots in the fall. You can see it styled in the past HERE and HERE. Quilted Vest: Who doesn't already own this?? Gah I remember when these first came out when I was in college and they were all. the. rage. It was like we had never seen a quilted vest before. But man have these stayed relevant all these years later. And I wear mine still all the time! It's just such an easy item to wear and it's functional because it will actually keep you warm!! Camel Wool Coat: Cannot tell you enough how much I've worn this jacket over the past three years. I originally scored it during the Nordstrom Sale and I'm so happy I did. It's the perfect jacket for when you want to look a little more dressed up or put together. Everyone should own a camel long coat. It's apart of growing up! LL Bean Boots: Ah a tried and true classic. What more is there to say about my bean boots? I love them. I wear them all the time and with everything. You need a pair if you don't have one already and you can read my all you need to know guide about buying some HERE. Wool Skirt: I have a weird obsession with wearing wool skirts in cold weather. A mini skirt, tall boot and sweater combo is a personal favorite of mine. And my poor bare (very white) little legs really take one for the team lol. The one (and really only) place I get great wool skirts from is J. Crew (which includes factory). They haven't brought out their official line of skirts for this season but you best believe when they do imma buy them all! Right now the Factory has a pretty good selection. I actually got the skirt in blue and camel already!! AG Blue Jeans: If you remember this post or legitimately any post from any fall look where I'm wearing dark jeans, then you know these jeans. I have three pairs of them because I love them that much. They are the best jeans -- high waisted, stretchy (but never stretch out), long and dark that won't fade. They are expensive for jeans but as I've been wearing them for years, I can attest that they are worth it. They are also sold everywhere/very popular so you can 100% find them on sale (and often!) Perfect example -- they are 25% off at Bloomingdales (all styles) and 21-70% off at Amazon. They also have AG styles on sale for 25% off at Neiman Marcus and close to 50% off at Nordstrom Rack. White Denim: So I re-wore my AG white jeans this past weekend and while I LOVE AG (like love love) I remembered that the white pair I own are soooo uncomfortable. They're like "low waisted" if that is even a thing and had just a strange feeling to them. Granted they are like 6 years old but still. It just made me remember how much I love my Vineyard Vines pair. I'm obviously not one to care about the no white after labor day rule but there is something so fun that happens when you wear white jeans in the fall. I love nothing more than to pair them with a really chunky sweater, a Barbour jacket and my LL Bean boots. White jeans are universal and more people need to realize that! I know this post was a lot of "my favorite this" and "my #1 that" and "omg I loveee" but these are my #1's of #1's when it comes to clothes. They are like my children and I love them all in their own way. If I could only have one wardrobe for fall, I would hope it could be this. The possibilities are endless!